For occasional chainsaw applications. Anthracite and high visibility orange with denim look, 65% polyester, 35% cotton, elastic strap for enhanced comfort, light and breathable, Y-threading of closures for fast fitting and removal, reflective STIHL logo on right, extended cut protection area, EN 381, protection class 1 (=ˆ 20 m/s). 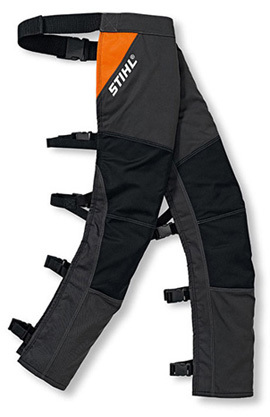 STIHL protective chain saw trousers provide protection against cuts to the legs based on an intelligent principle: when the chain cuts through the first of several layers of fabric, bundles of long high-strength special fibre are pulled out and block the sprocket, bringing the chain to a standstill and considerably reducing the risk of injury. Material allows water vapor to escape and fresh air to circulate.